Trousse ronde There are 7 products. Most attractive and so easy to embroider – you’ll just love it! A perfect little kit with everything you need to get going straight away : a workbag, an ‘Aida’ medallion, a pretty knot, needle and thread, a pattern and a guide ! Once you receive it, you embroider it in a couple of hours and … you then give it as a present (to yourself) ! 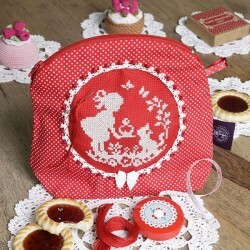 Here is a very nice kit coming along with everything necessary to start: a pouch with a medallion for embroidery, needle, cotton and stranded adorable node. With Elise and her cat cross stitching is good! 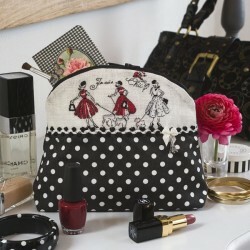 With a delightful embroidery in one strand over one thread, this pouch is just so haute couture. Totally exquisite with a lining in a gorgeous Napoleon III printed fabric. 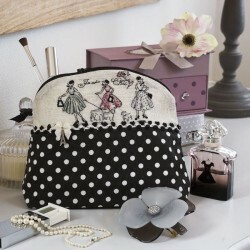 Perfect for formal occasions with your little black dress! Here is a very nice kit coming along with everything necessary to start: a medallion for embroidery, needle, cotton and stranded adorable node. With Swallow Adele cross stitching is good! Here is a very nice kit coming along with everything necessary to start: a medallion for embroidery, needle, cotton and stranded adorable node. With Rabbit Gabin cross stitching is good! 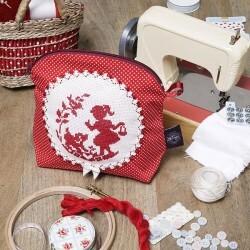 Here is a very nice kit coming along with everything necessary to start: a medallion for embroidery, needle, cotton and stranded adorable node. With Squirrel Noisette cross stitching is good!